Its been two weeks now and my little guy is still going strong with our Spider Theme!! He doesn’t seem to want to find another Halloween theme JUST YET with the exception of our The Magic School Bus: A Reading Book Character Event. We’ve had a lot of fun exploring Spiders across all environments, in EVERY subject, and at least one “sub-category”. That would be the study if the Spider Wasp! We discovered a really amazing, super gross fact here. Just home from school! And hiding from the sun in the shade of our hedges. Math is also one subject that my guy works on everyday even if it is a short activity. To do this with a spider theme I chose to make his activities as simple as possible. Meaning, the next step for me was to search awesome homeschool blogs for resources. I didn’t have to look very long since Halloween is next week. 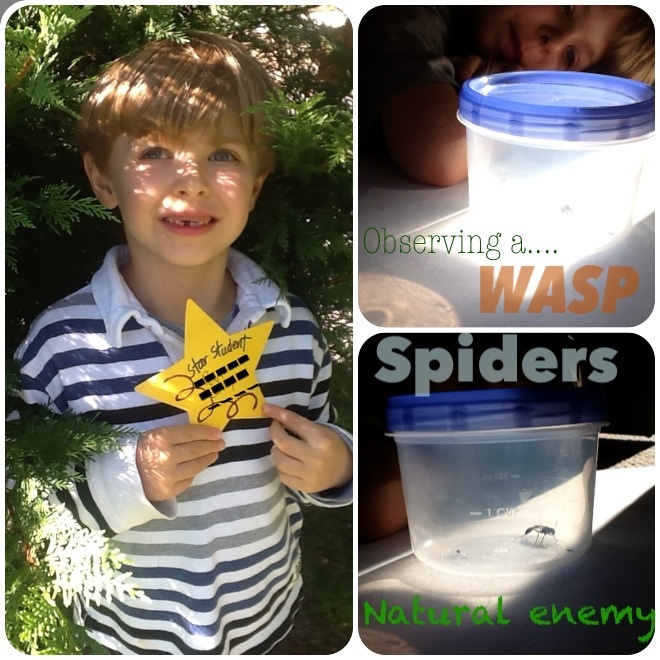 There were spider activities galore on my search results! This really is luck. Remember my son is who gets to choose the themes. Bottom right is Playdough To Plato’s FREE 100s Chart and 10 Ways To Use It that we used over the summer. Still Playing School had a great Math spider ring activity!! I know I will be trying soon when my son is ready for multiplication. Yep! I got my eye on that one! So, my son needed a move to think addition/subtraction activity. 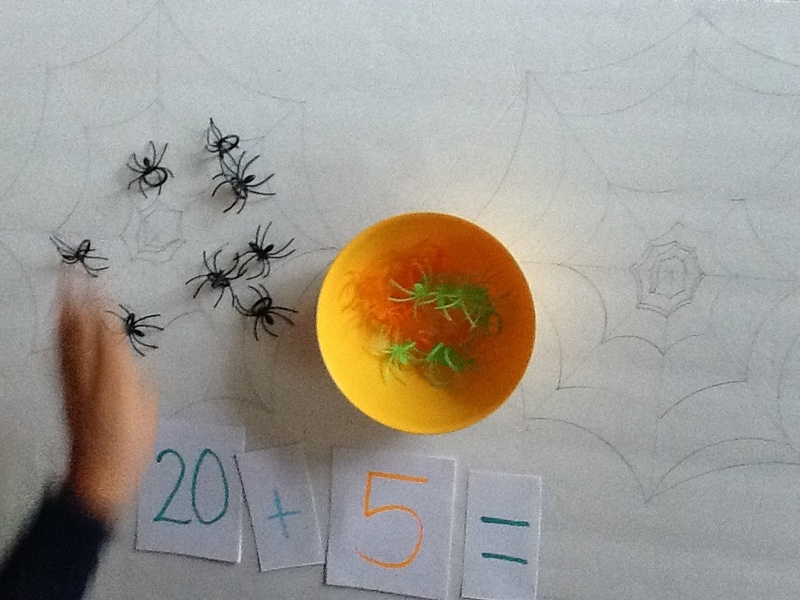 I did not however, find an addition/subtraction spider activity that did not require a printer or items like counters. Our printer is down for the count…. First, I used a large poster board to draw 2 spider webs. 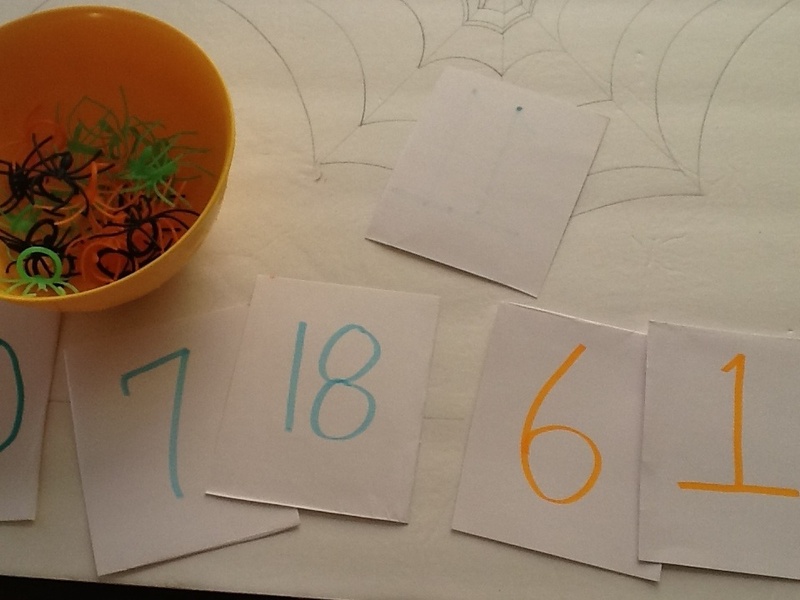 To get an idea of how to easily draw spider webs, you can check out our last spider activity here. 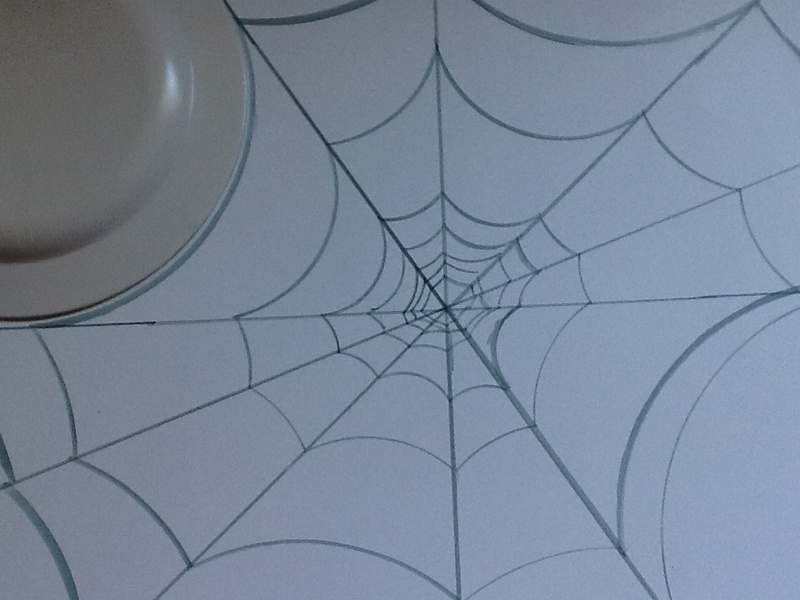 NOTE: With those 2 spider webs finished, I drew 3 lines using a ruler but you don’t have too. The lines I placed below the spider webs. We used the lines as a spot to place the numbers he would find sums for. These visuals can reduce confusion, help them remain on task, and promote independence for children that need the supports. Now we are already on the last step!! 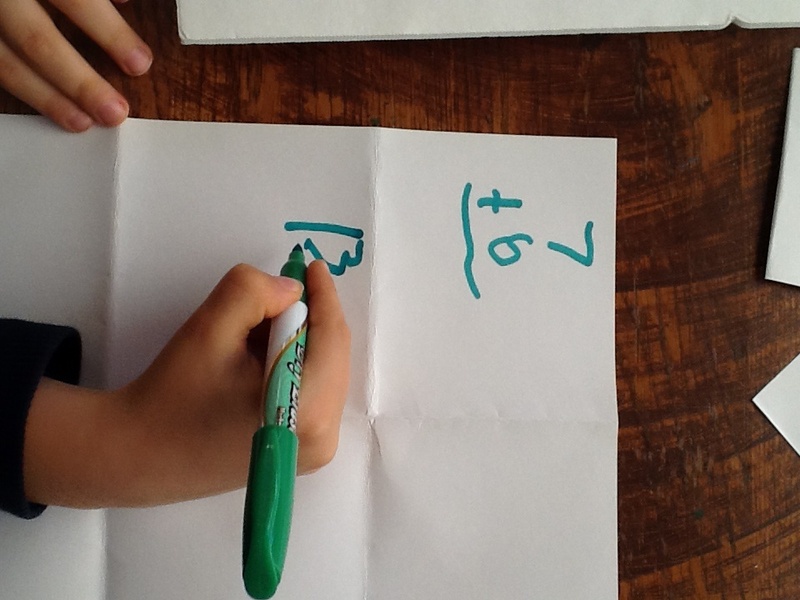 Fold 2 or 3 pieces of card stock to make rectangular squares to write your child’s practice numbers on. 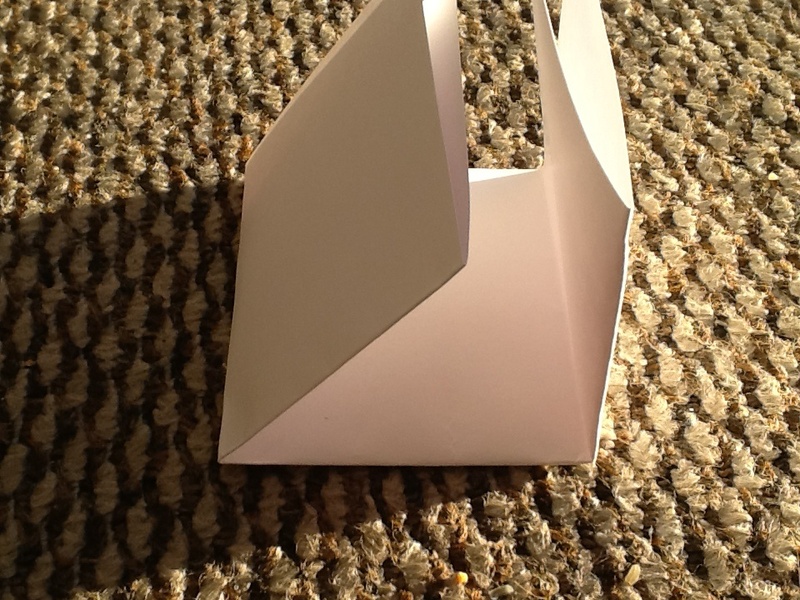 Fold the card stock first in half then make 2 more folds. 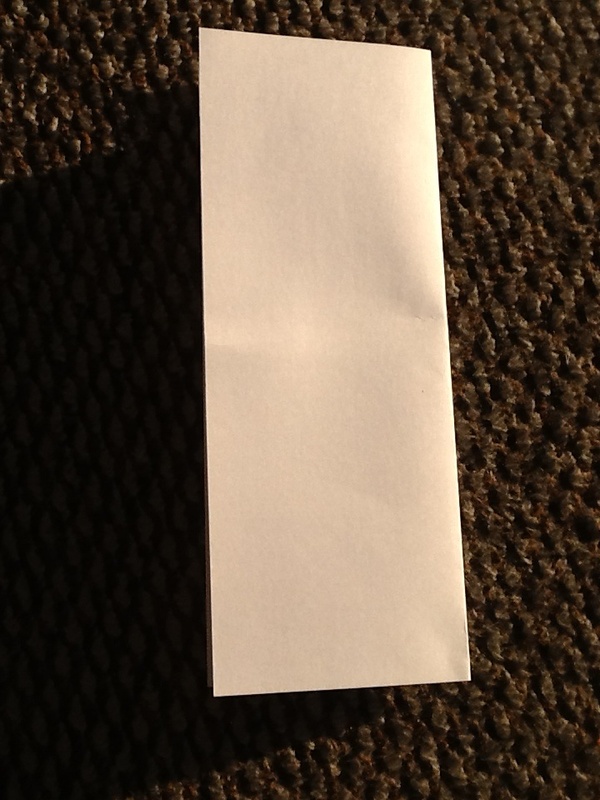 You will end up with 6 rectangles per piece of card stock to be cut out…. I used 3 pieces the first time we practiced and several more later during the week for additional practice. 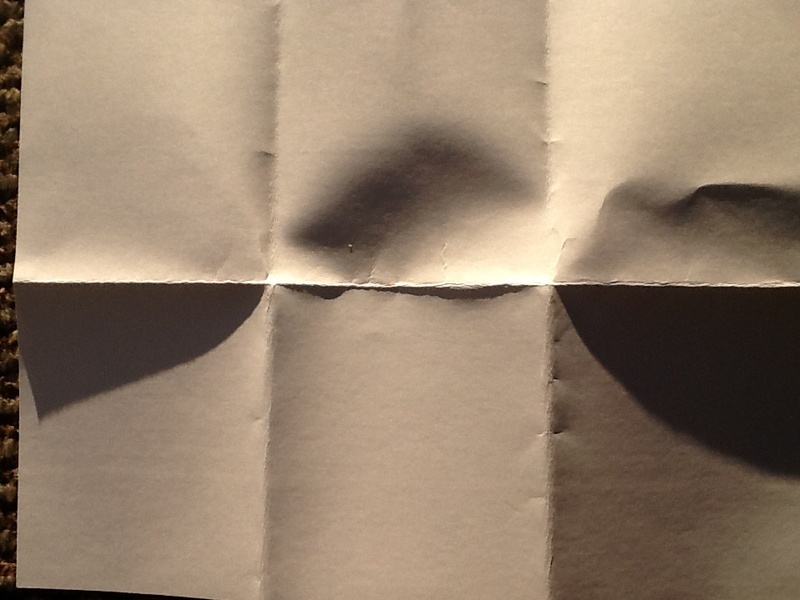 For the addition, subtraction, and greater than/less than signs, simply fold and cut 2 of the rectangles out. Then write the signs on them.! 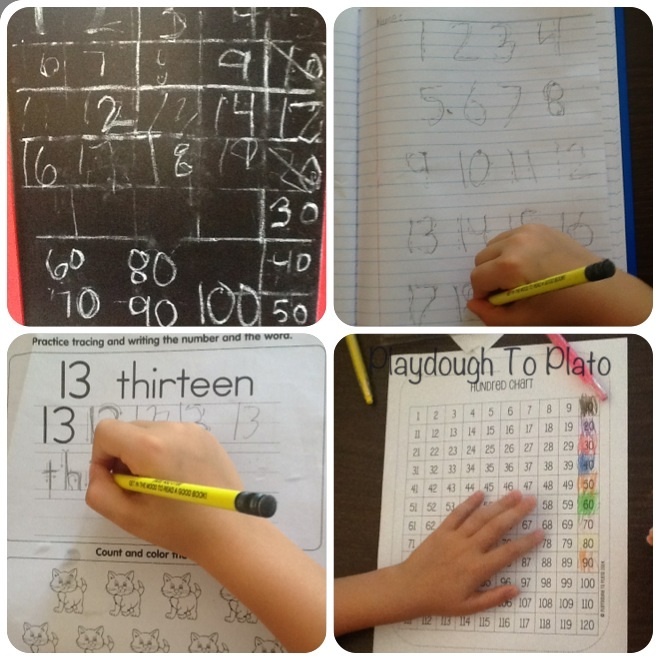 Write different numbers for your child to practice adding and subtracting. We warmed up with single digit numbers then moved straight along to double digits. 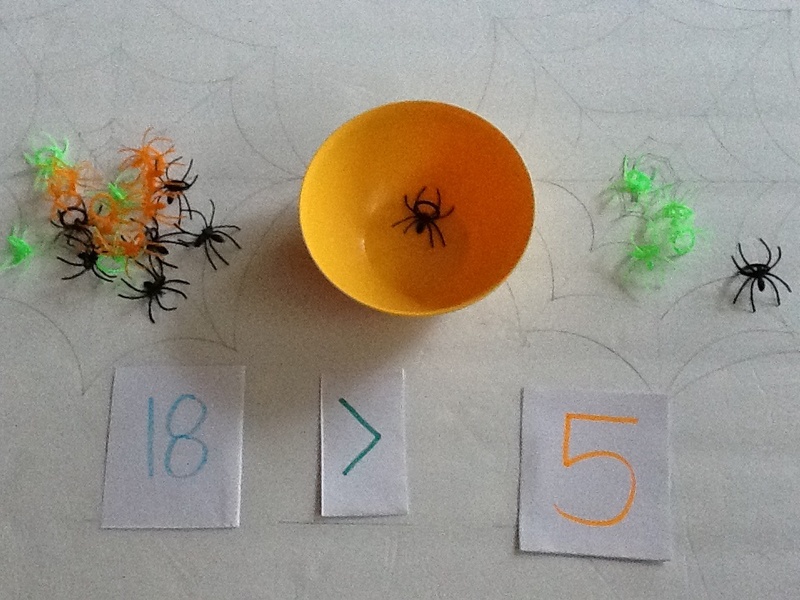 Turn the numbers over and place a stack of numbers under each spider web for the child to chose from. 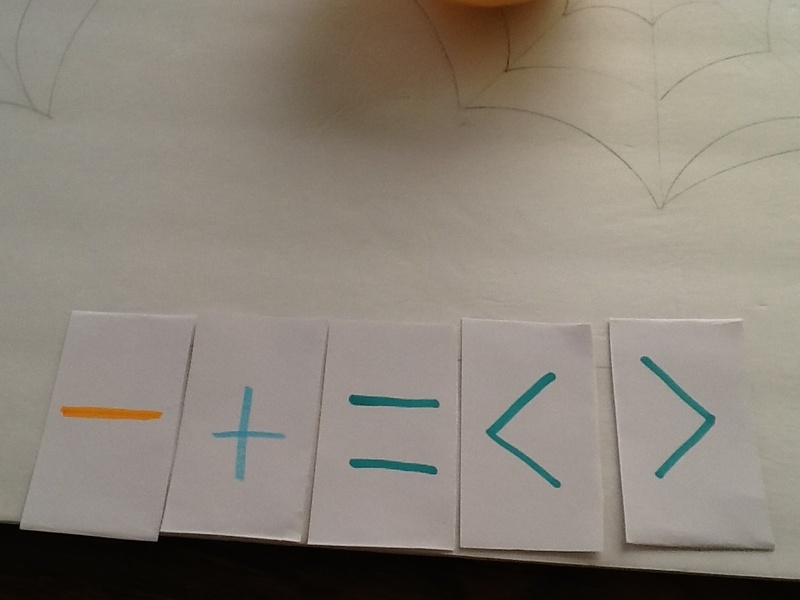 I also asked my son to write each number down in the form of a solved problem. Greater than/ less than practice…. 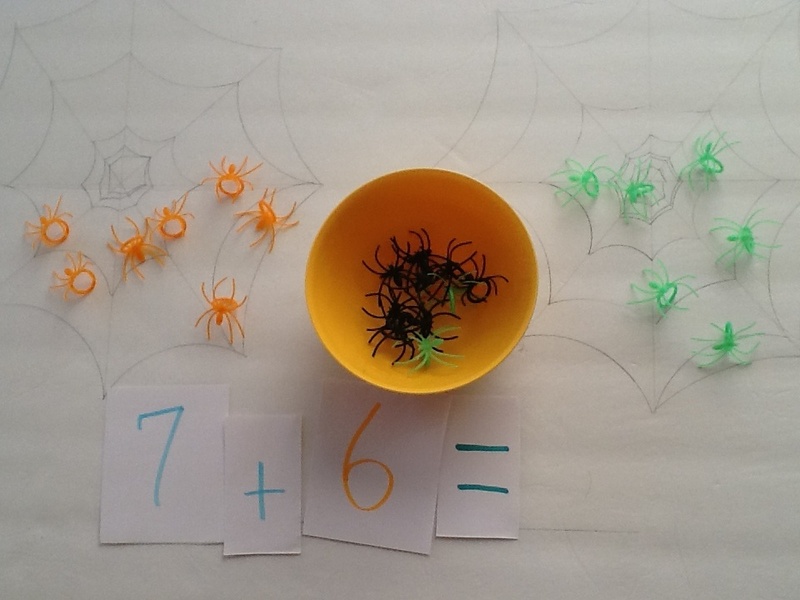 This spider ring math activity we also used during with our spider theme week. 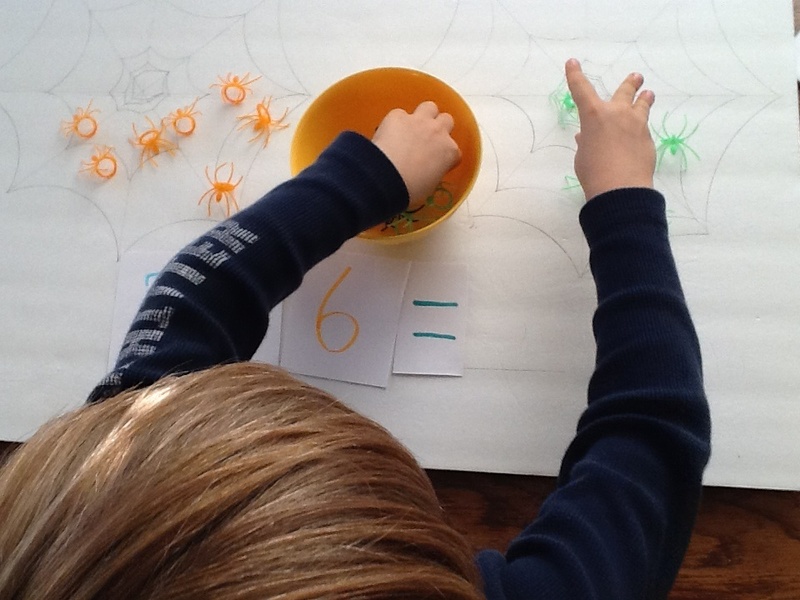 It is Prekinders Spider Ring Counting Game with printable. 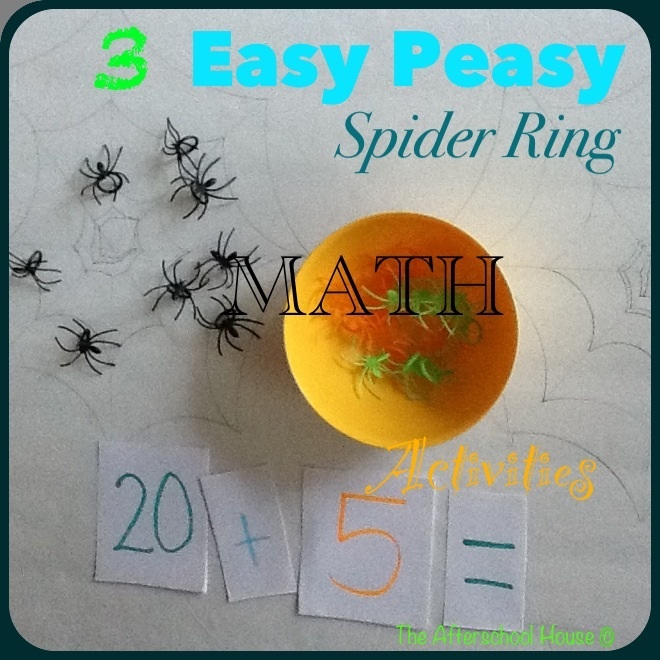 If you would like to add to this mini math spider ring round-up, please make your suggestions in the comments. I would love to see how you have used spider rings for math!!! Oh it was! I couldn’t count the times he pulled this out to use it:) we just left it on the craft table for a while.